Symantec’s Norton Anti-Virus software was known as the typical example of slow and bloated Anti-Virus software a few years ago. But, things change, so today I took the opportunity to do an in-depth analysis of Norton 360 5.0. It’s a full-blown Internet Security suite with a few other features that aren’t usually included with anti-virus software. Norton 360 has its name because it provides not just Anti-Virus protection, but also a Firewall, blocking of malicious websites, and protection from multiple types of malware such as rootkits, Trojans, and spyware, and a bunch of PC Tuneup and optimization features. So it provides 360 degree, or all-around, protection. 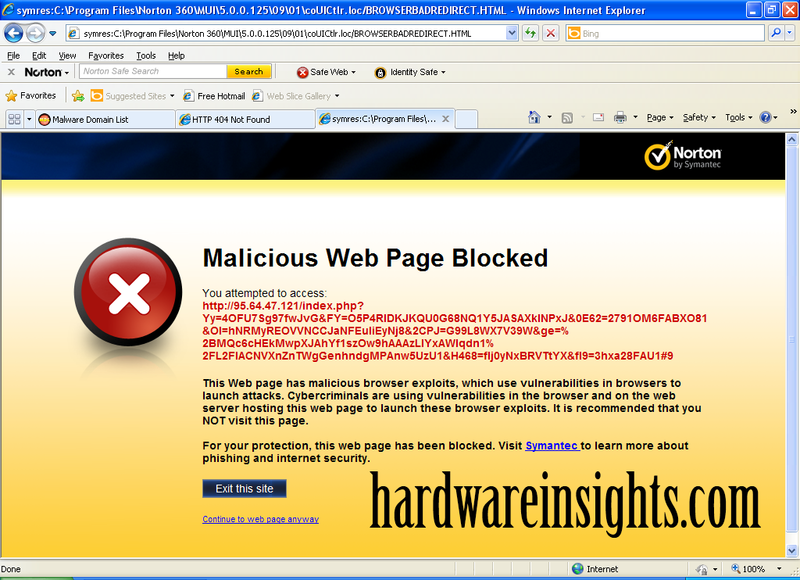 At least that’s what Symantec wants us to believe. Norton 360 costs $79.99/year for up to 3 PCs. However, you can get it for $39.99 right now from their website. By the way, if you have read one of the earlier anti-virus software reviews here at Hardware Insights, you might be a little surprised by this one. Since I am going to be releasing a lot of anti-virus reviews in a short period of time I’ve set aside two computers to do more in-depth protection tests than in my previous reviews. My testing is as such: To go to Malware Domain List in Internet Explorer (I used it because it is known to be less secure of a browser than Mozilla Firefox), and to go to all of the malicious domains listed on the first page. Then I will click Allow, Continue to Unsafe Page, Continue Unsafe Download, or any other warning given by Windows or Internet Explorer, and only regard the warnings of the product I’m testing. 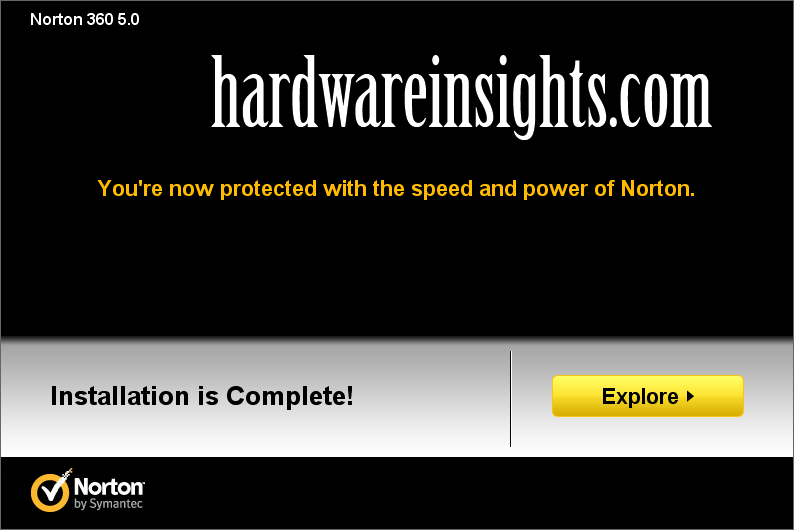 This is obviously stupid, but it more accurately tests the software product (in this case Symantec’s Norton 360 5.0). After all testing on the computer has been completed, I may remove the hard disk from the computer and attach it via USB to another (clean) computer for scanning by either SuperAntiSpyware or Malwarebytes’ Anti-Malware, to verify that the scanner of the product being reviewed actually cleaned off all the malware. I decided to download the 30-day free trial. It provides all functions and features that the paid version of the software does, except that the protection expires after 30 days. 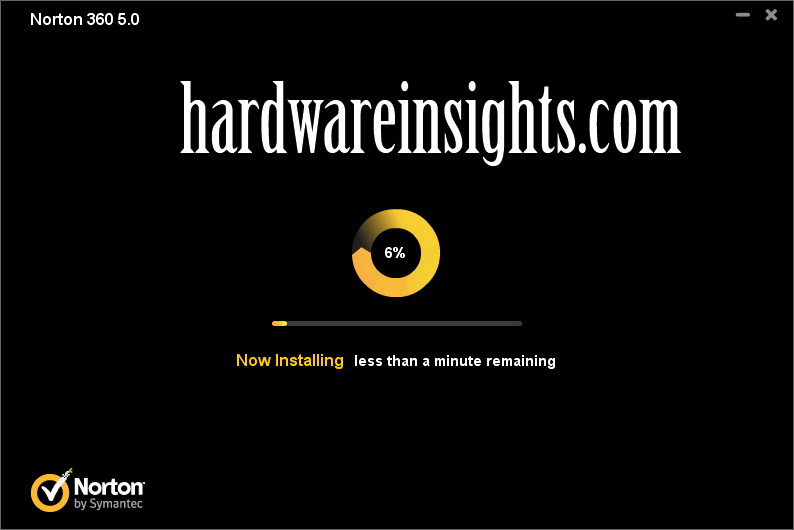 The installer took less than 5 minutes, starting from the time the download was completed to the time at which I was told to restart the computer (which is often the final step of installing any anti-virus solution). After a restart, Norton forced me to activate the software by creating an account. There was an option to not create an account but it did not work. 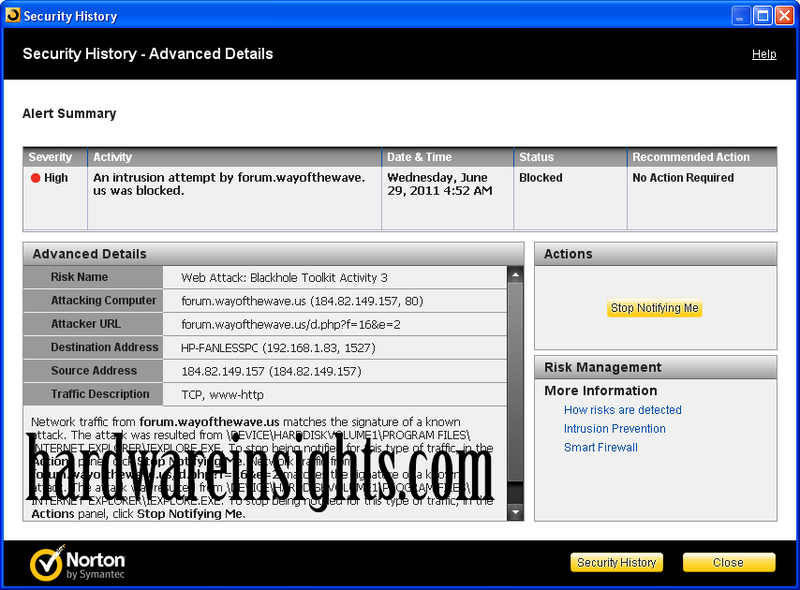 It does include a listing of all the threats Norton 360 has detected and removed, along with a brief analysis of the threat. This is where the new testing procedures really show the protection rate of the program. Upon testing, I got multiple warning messages and alerts. Norton caught 95% of all attacks. You’re probably wondering what happened to the other 5% of those attacks. Well, I’ve got an easy answer for you: Norton caught the single remaining threat that it missed previously. That’s pretty good. Note that in the screenshot, there are “31 risks”. The additional 30 are just tracking cookies from ads, etc. on websites. They aren’t malicious, that’s why I’m not counting them in the percentage statistics. 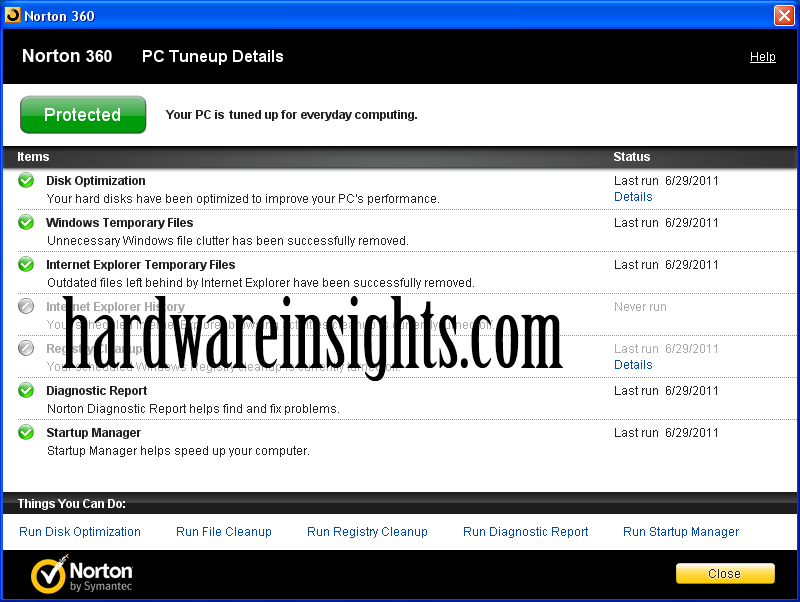 Norton 360 includes some handy optimization tools to clean up your computer and make it run faster. It includes a disk defragmenter, a cleanup system that removed unnecessary temporary files left over by Windows and Internet Explorer, a Registry cleaner, and a Startup Manager that provides an easy way to select which programs start up with your computer. These tools are nothing extremely exciting, but they do make it unnecessary to have tools such as CCleaner (a great piece of software by the way), and it’s a one-stop-shop for other things like your disk defragmenting needs, (to save you hunting for the Disk Defragmenter utility included with Windows). I didn’t really notice a difference in the speed of the computer, but since it’s got an anemic 1GHz CPU and only 1GB of RAM, it was pretty slow anyway, making it almost impossible to tell. Discuss this review in our forum here!